It’s painfully obvious that school is back in session. 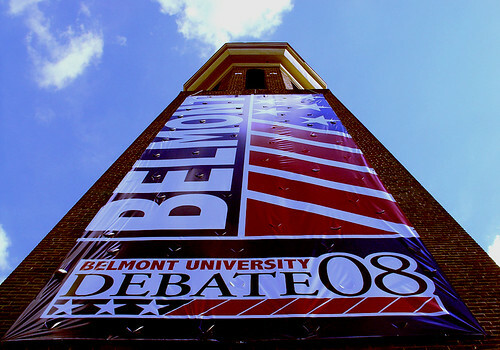 Mafiaoza’s is impossible to enter on 2-for-1 Tuesdays and Belmont is ever flailing the “Debate ‘08″ signage. We poke fun, but we really are proud of our local universities. We hear about Vandy all the time, but Belmont and Lipscomb have had some pretty significant accomplishments in recent weeks and we’d like to give them a pat on the back, too. Belmont University set record enrollment at 5,000 students this year, a full two years ahead of schedule. It’s hard to imagine them all crammed on that campus, but they seem to be doing just fine (well, except for their parking woes). Lipscomb University also set record enrollment at 3,000 students this year. And aside from letting in massive amounts of freshmen, Belmont’s fairly new entrepreneurship program has been ranked one of the best in the nation by Entrepreneur Magazine and The Princeton Review. Not to be outdone, Lipscomb raced to have the first college of pharmacy in Middle Tennessee. Oh wait, then Belmont started one too, so no one really got to be first. And earlier this year, Belmont was paid a backhanded compliment by BusinessWeek, ranking as its 89th Best Undergrad B-School pick. B stands for Belmont, right?